I've mentioned it before, but I'll say it again: we're so lucky to live only minutes away from the one and only Oompa Retail Store. 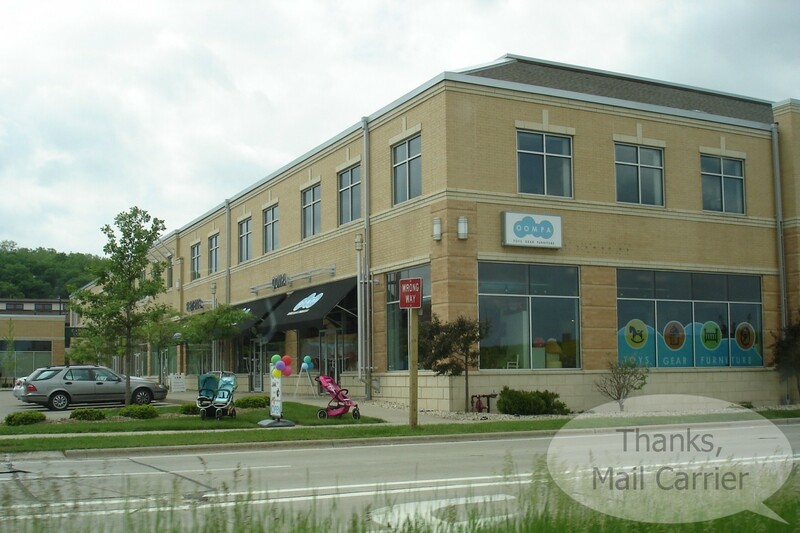 The building itself is modern with clean lines and the surrounding shops and restaurants are also inviting and open. But one glimpse in the windows of Oompa and you're immediately drawn inside. The combination of the bright colors, natural light and friendly atmosphere makes you feel like you could browse, shop and play for hours. It's big enough that their selection is wonderful but not so huge that you feel like you're in a warehouse and need to stop and rest after viewing aisles of generic toys. Plus, every Oompa employee that I've ever encountered is warm and genuine and seems to know if you want help or just to peruse on your own (I hate stores with staff that are pushy). Even if you regularly visit just so that your kids can have fun touching and trying out everything (ahem), you'll never feel unwelcome. Sounds like a pretty great place, doesn't it? On our most recent visit to the Oompa Retail Store, after taking in all of the new changes and displays, Big Sister E and Little Sister B headed straight for one of their favorite sections, the "grocery store" of beautiful and natural HABA toy foods. If you've never seen HABA toys, you're missing out. A family-owned German company, the attention to detail and high quality is evident in every item they produce. Instead of the vast array of cheap plastic that is on the market, HABA is dedicated to creating educational and enriching products that will entertain and last a lifetime. 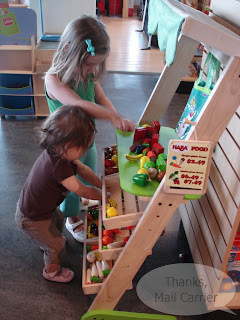 HABA's play food is no exception to their standards of constructing toys that are well-made and fun. Using smooth wood or soft fabric, they take children beyond just toy apples and bread (although they have those, too). 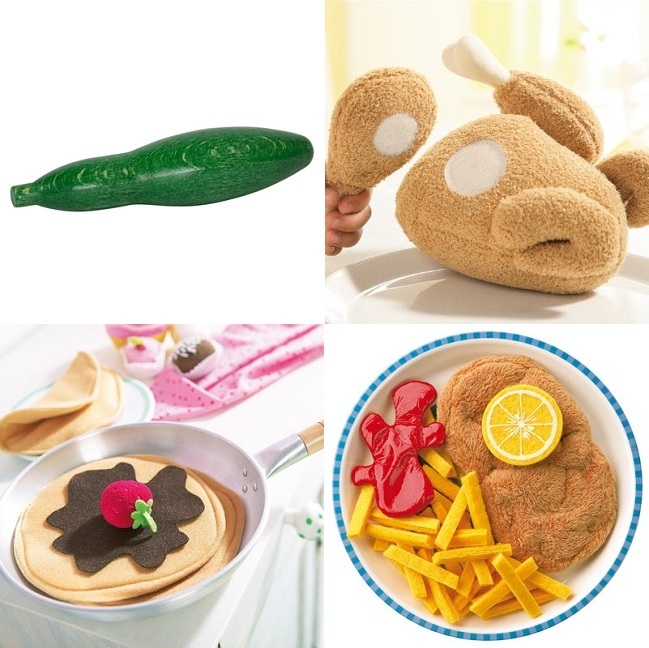 How often does your child play with a realistic cucumber? Or pretend crepes or grilled chicken or wiener schnitzel with french fries? Not regularly, right? Even my husband had to admit that being able to attach and detach the legs on the chicken was pretty cool. Not enough to just "buy" the food when playing with it, Big Sister E was only too happy to spend some time in the HABA Mini Shop as well. 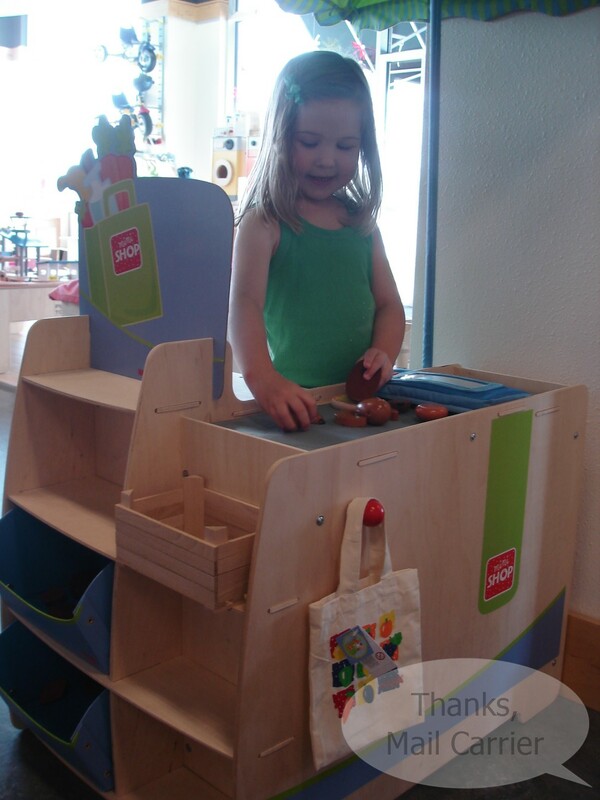 This little wooden market has everything that a child needs to enjoy imagining in their own little store. The accompanying produce, money, shopping bags... it even has a barcode scanner that squeaks! It doesn't get much cuter. 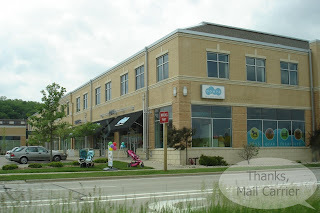 The great connection between HABA and Oompa Toys is easily seen throughout the rest of the store (and on their website) as well. There are HABA baby toys galore that would make perfect shower gifts, HABA jewelry that Big Sister E very carefully and thoroughly examined, beautiful HABA rugs that would brighten up any child's room or playroom, and HABA games for all ages and abilities. Everywhere I looked there was something else to culture young minds while providing entertainment and amazement. 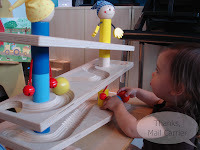 Before we left, Big Sister E and Little Sister B had to make sure to spend some time with one of HABA's crowd-pleasing toys, the Ball Track Roll 'N Roll 'N Roll. Every time we have been in the Oompa Retail Store when children are around, this toy draws attention. For ages 18 months and up, they love to watch the colorful balls wind their way down and listen to the varying noises that they make along the way. For independent or group play, this truly is a lot of fun for everyone. Whether we're visiting the store, browsing online or enjoying our purchases, our experiences with Oompa have always left my family smiling and happy. And, without fail, as we were walking out after this visit, Big Sister E turned to me and asked, "We go there again, Mommy?" I took her hand and nodded. Of course we'll be back. Be sure to sign up for the Oompa Toys newsletter, connect with them on Twitter and Facebook and check out their blog for more information. And while you're reading their blog, don't miss their post with a great video tutorial on how to purchase from or create a wishlist on Oompa's website. I think the hardest part of making your own or shopping off of someone else's wishlist would be deciding which amazing Oompa product is your favorite! wowza, that looks like big fun! The name makes me happy b/c it makes me think of Oompa Woompahs from Willy Wonka (not an accident,I am sure0 and I love the high quality toys there, I get sick of more plstic JUNK! Love how those fries look! I need to research BlogHER 2010 nd get my booty there as well! I have never heard of Oompa Toys, but it sounds like an amazing place! They only have one store??? Wow!!! So cool that you're going to BlogHer. I can't wait to meet you!!!! !